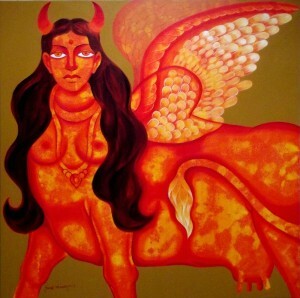 This Painting is on the divine bovine goddess – the one who grants all the desires of her devotee. She is the symbol of purity and fertility and is said to be the embodiment of 330 million Gods of the Hindu pantheon. 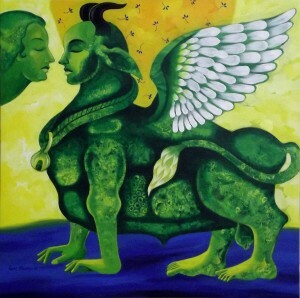 The painting embodies the clash of cultures where the subject of veneration as a deity is also a source of food and to be slaughtered and eaten. The strong emotions evoked by the sight of slaughtered cows hung up for sale as meat informs the painting.